This book is a companion volume to 'Celebrating the Quaker Way' and offers explanation on Quaker practice in Britain. Written as part of the author's ongoing ministry, it draws on his experience of Quakerism and includes extracts from Friends. 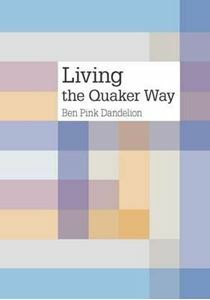 'Living the Quaker Way' is a companion volume to 'Celebrating the Quaker Way', which affirmed the wonderful riches of the Quaker tradition. This book contains explanation. It explores why we do the things that we do in the way that we do them. Written as part of the author's ongoing ministry, it draws on his experience of Quakerism and includes extracts from Friends talking on these topics. It is a book about us and for us, based on the Quaker way in Britain. This pocket-sized book celebrates the Quaker way and affirms the wonderful riches of the Quaker tradition in Britain, and the Quaker 'Liberal tradition' more widely.